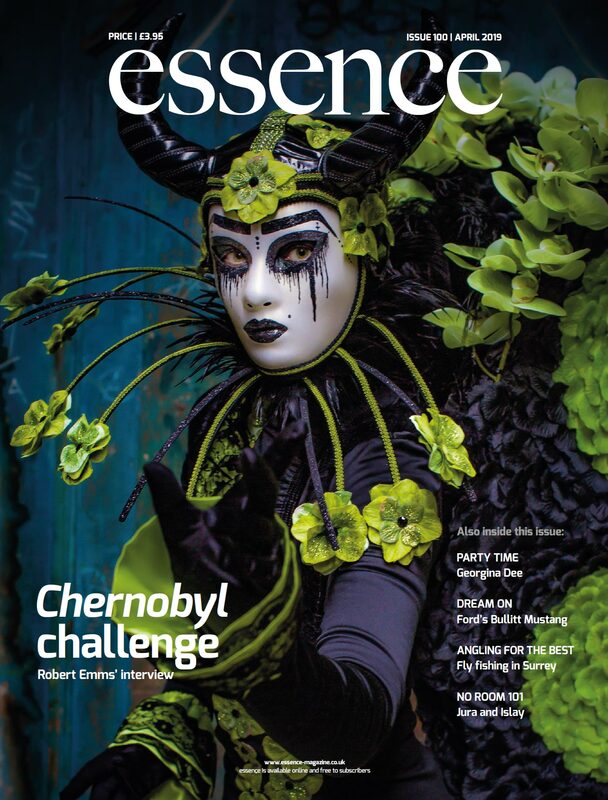 In part 2 of our selection of the world’s finest homes, Lucy Crossfield continues her look at some of the most exotic, luxurious and unique houses money can buy and all outstanding examples of architectural prowess. Villa Kogelhof exceeds expectations in many ways. Not only is it an architectural triumph, with an underground level containing space for six cars, an office space and bathroom, and a living area atop two ‘legs’ with stunning 360 degree views, but the home is also leading the way in terms of sustainable living. Architect Paul de Ruiter designed the house to be entirely self-sufficient. Villa Kogelhof’s glass walls help to insulate the building, while solar panels on the roof provide more energy than is needed. The villa also boasts its own in-house cooling system, as well as a clever ‘water roof’ which enables the basement level to be flooded with natural light. Approximately 70,000 trees were planted in the surrounding acres of previously underused land, ensuring Villa Kogelhof is situated in the midst of a thriving ecological community. Located in an exposed area of Victoria’s southern coast, Croft House draws its inspiration from the elements. Architect James Stockwell was asked to create a property that would offer protection from the wind, rain, sun and fire. Its winged structure lies low and flat in the ground, with its entrance and front garden sheltered from the strong prevailing winds. Exterior walls are clad in zinc to further shield the building, and as James explains, they require “virtually no maintenance”. A woodburning stove takes central position inside, efficiently heating the well-insulated home. 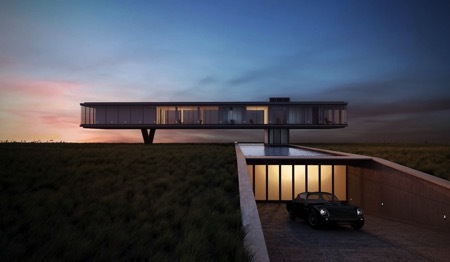 Croft House is an emphatic example of how hostile elements can inspire exceptional architecture. This 5,300 square foot property is a sight to behold. Designed to achieve a sense of harmony and balance, as much care has been poured into the outside space as the interior. Glass walls are a prominent feature throughout: though not at the expense of residents’ privacy. 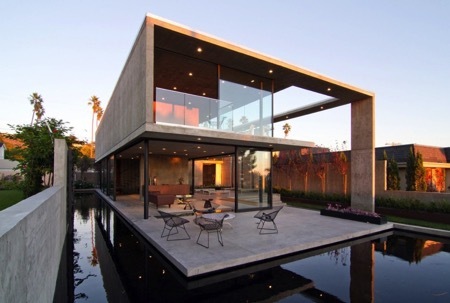 Concrete façades have been cleverly positioned around the outskirts of the property to offer seclusion as well as visual appeal. A cut out concrete roof offers shelter to a portion of the outside space, while ensuring natural light reaches the main house in abundance. The beautiful pool that surrounds the property has zones for casual swimming as well as lengths, and creates an island-like oasis of calm in the central dining area. Inside, furniture is kept to a minimum, with simple, clean shapes used throughout. 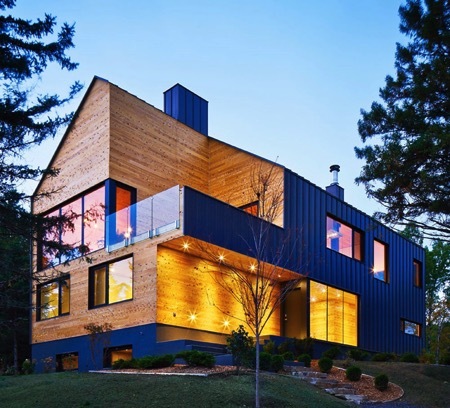 This Canadian property sits majestically within its surroundings. It boasts spectacular views over the St. Lawrence River and the thousands of spruce trees that fringe its borders. Architects at MU Architecture drew much of their inspiration from the surrounding forests. The dark grey metal that clads three of the outer walls and roof forms a protective shell, while the final wall of the exterior is stripped back to reveal a softer, wood-panelled finish. This, the architects say, represents the idea of a tree’s bark being peeled back to reveal its fragile inner core. Wood is a key theme of the property’s interior too. Ceilings and walls are almost entirely covered in wood and the entire property has a cosy chalet-esque feel. Edgeland House is a shining example of restoration and rejuvenation. The land was a former brownfield site that had been neglected following many years of industrial misuse. Architects at Bercy Chen Studio were tasked with creating a home that would heal the land, rather than disrupt it further. The best way forward? Create a modern re-interpretation of one of the oldest housing typologies in North America, the Native American pit house. Traditionally pit houses were sunk into the earth to offer shelter, protection and thermal regulation. Edgeland House looks to recreate this. The grass-covered roof keeps the home cool in summer and warm in winter as well as supporting local wildlife ecosystems. Framed by the Andes Mountains and surrounded by Argentinian vineyards, there are worse places to be than Evans House. Architects drew inspiration from a fallen, hollowed-out tree trunk, building a long and linear structure rather than one that was tall and invasive. Indeed, designers ensured Evans House was as unobtrusive as possible and aimed to complement materials and shapes with the natural landscape. The main façade is clad in rusty steel while the supporting structure is built from river rock. 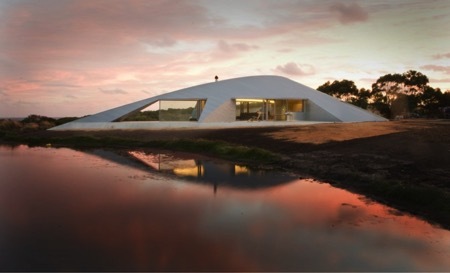 From a distance, the house appears to melt into the landscape as a mere shadow. Continuing the tree trunk resemblance inside, each room showcases beautiful wooden panelling. Other enviable features include an extensive wine collection housed in a purpose-built wine cellar, rooftop pool and large entertaining space. 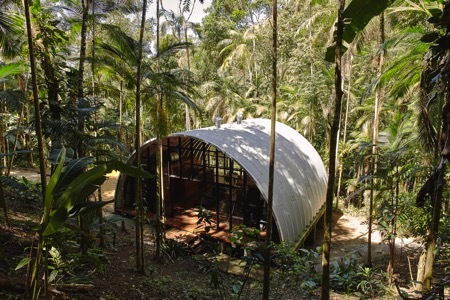 ARCA is a brilliant project hidden deep in the Brazilian forest, close to the beautiful Perequé waterfall. The structure is designed and built from a single shell of composite carbon steel, aluminium and zinc. This allows the home to be dismantled easily and rebuilt in different locations, with minimal impact to the surrounding forestry. ARCA has two bedrooms, kitchen, bathroom and a generously proportioned living space. Each room has unobstructed views over the rainforest thanks to the huge semi-circular windows that front the property. Atelier Marko Brajovic’s aim is to encourage families, professionals or couples seeking a totally immersive jungle experience to come and stay at ARCA for a short period of time. In 2010 when a large earthquake all but destroyed a large timber barn in Chile’s Aculeo Lagoon region, two brothers from architect firm Estudio Valdés Arquitectos saw an opportunity to resurrect the impressive building. Large portions of the original barn’s timber framework were salvaged and moved down country to Lake Ranco, where the brothers began their new project. Naturally, the architects wanted the reclaimed timber to become the focal point of the new building. They worked hard to design a structure where the timber trusses span the entire width of the building, with no internal columns to distract from the impressive feature. Large glass walls wrap the house in order to: “recreate the experience of being in the forest, but also of being sheltered,” the architects explain. 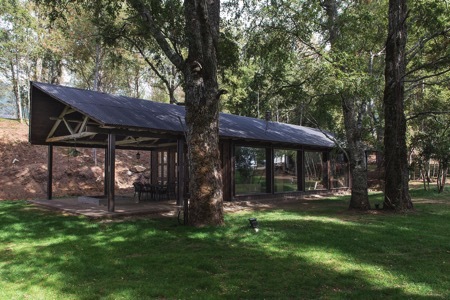 Now nestled on the shores of Lake Ranco, this beautiful barn house has certainly stood the test of time. House Mouton is full of rustic charm. Every aspect of the property has been designed with the environment in mind. The home is divided into four single-storey sections – for eating, sleeping, services and guests – to minimise visual disruption to the surroundings. Ceiling heights are kept low for the same reason and great efforts were made to use only natural materials in building House Mouton. Inside, the designers aimed to create a ‘warm home for its dwellers without opulence’. Wood, rattan and stone in earthy hues are used throughout in order to achieve the desired look. 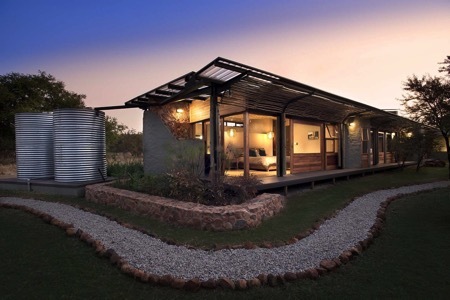 House Mouton blends seamlessly into its bushveld surroundings. Leobo Private Reserve is much more than an exquisite home. 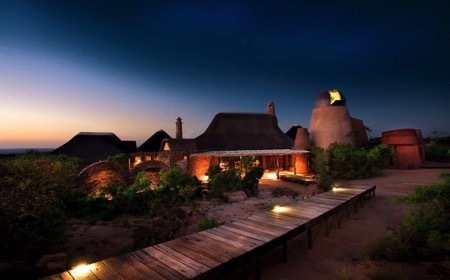 The property lies in the midst of a 12,000 acre private wildlife reserve and has been dubbed the most sought after safari lodge in Africa. The décor is rustic-luxe, yet no expense has been spared on additional features. The home includes an infinity pool and a world-class observatory centre that allows users to admire the night sky in complete privacy. All bedrooms are fitted with floor-to-ceiling windows throughout, and many include a stunning circular bathroom complete with freestanding tub. Until recently, the property was used as a holiday home for a British family, but it has recently become available on a limited commercial basis. Head over to the Leobe Private Reserve website for more details about this unforgettable safari experience. 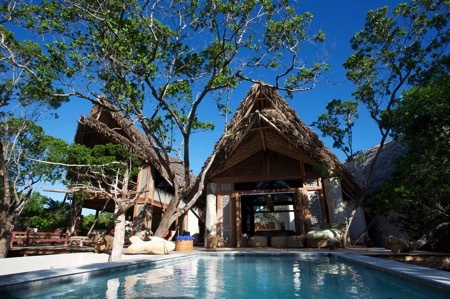 Villa Suluwilo is nestled among three acres of forest on one of Mozambique’s most exclusive luxury islands. The beachfront property can provide those staying with the ultimate getaway: relaxation is the name of the game at Villa Suluwilo. The stand-out features of the villa are the ‘dhow sail’ roofs, inspired by the Arab dhow boats that used to frequent the area in the fifteenth century. The roofs are carefully angled to encourage sea breezes to flow through the property, keeping it pleasantly cool even in strong sun. There is an Arabic edge to the interior décor too: guests can relax in the sunken Arab courtyard or dine amid the earthy orange and red hues of the living spaces.